Measles is one of the most common childhood diseases. It is a viral infection which affect mainly the skin and respiratory tract. For most children this means seven to ten days of high temperature, coughing, rash and misery. Also, not all children have the disease in its simple from and there are some possible complications ranging from mild to very serious indeed. Because it is a viral infection, measles dose not respond to antibiotics. However, many of the complications which can accompany measles are bacterial and therefore can be treated with antibiotics. Fortunately, tough, the illness is avoidable. The measles vaccine offers almost 100% protection and its enthusiastic use in the USA has meant that the disease will probably vanish altogether from the United States in the next few years. Measles is caused by a virus which is passed on when a child breathes in the infected droplets sprayed into the air when a person who already has the illness coughs or sneezes. 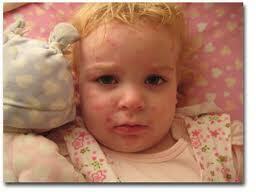 The disease is infectious for about ten days, from several days before the rash appears until about a week afterwards. Once in the bloodstream, the virus spreads rapidly to various parts of the body where it multiplies during the eight to fourteen day incubation period. The first signs of illness occur at the end of the time when the child develops a streaming nose and sore, red, swollen eyes. The throat may be sore and the child is usually racked with a dry, irritating cough. There is a rise in temperature usually more marked in the evening to between 37.2°C and 38.3°C (99 °F and 101 °F). the child becomes miserable and loses his or her appetite. In addition, all interest in playing may be lost and the child will not want the company of friends. During this stage, before the rash appears appears, a positive diagnosis can sometimes be made by observing Koplik’s spots surrounded by a red halo on the mouth and are a tell-tale sign of measles. Two or three days after the first signs of the illness, the rash begins behind the ears and on the forehead. It then spreads downwards until , after a further two or three days, the whole body is covered. At first the spots are dull, red, slightly raised and little larger than a pinhead. They quickly enlarge up to about 1 cm (1/2 in) in diameter and join together to from larger irregular blotches. As this happening, the fever raises to between 40°C and 40.5°C (104°F and 105°F) and child feels extremely ill, looks very unhappy and may sound very ‘chesty’. The rash us its worst for about three days before slowly fading. Then the temperature falls and the child feels much better about seven to ten days after the symptoms first appeared: he or she will no longer be infectious. Before the rash has appeared the illness may be mistaken for a heavy cold but the red, swollen eyes and general misery are clues to the true cause. Occasionally the rash is initially mistaken for German measles the child is far less and the rash is pinker, finer and rarely blotchy.